There are many health and environmental reasons to grow your own sprouts (check out my article for 10 reasons). While you can purchase them at your local grocery store or health food store, it is so easy to grow them at home. Growing your own is a great way to have a supply of gourmet varieties, ensure access to high quality fresh foods year round if you live in a colder climate, or simply to become more aware of the food you are eating. I prefer the jar method which involves using a wide-mouth mason jar and either sprout lids from a health food store or cheesecloth and a rubber band. You’ll need only a few basic supplies to get started sprouting. They include: organic sprouting seeds, nuts, legumes, or grains (such as mung beans, alfalfa seeds, clover seeds, broccoli seeds, and garbanzo beans.) Avoid sprouting kidney beans as they are poisonous if eaten raw or sprouted. Make sure the seeds you choose are from a reputable supplier that can guarantee they haven’t been heated during processing, which prevents them from sprouting. Now you’re ready to get sprouting. Remove any broken or discolored seeds, stones, twigs, or hulls that may have found their way into your sprouting seeds. TIP: To increase the mineral content of your sprouts, add a piece of kelp or other type of seaweed to the water while the seeds are soaking. Subscribe to my free e-newsletter World’s Healthiest News to receive monthly health news, tips, recipes and more. Adapted from my book The Life Force Diet. 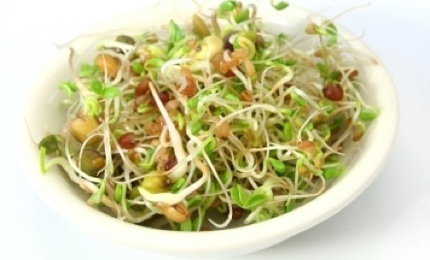 Check out my article 10 Reasons to Eat Sprouts. Still YUCK...even if they ARE homegrown.